Moist and delicious red wine brownies are one of the easiest wine desserts you can make. 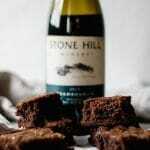 Using a brownie mix, just swap in a medium-bodied red wine and you’ll have a chewy red wine brownie ready to serve! If you like this recipe, please give it a 5-star rating! Preheat oven according to the box directions. Mix the ingredients per the box directions. Everything will be as listed, except swap out the water for red wine. Normally it’s about 1/4 cup but follow the box directions. Bake according to the box directions. Remove from oven, let cool, then cut and serve. The water quantity will vary per box mix, however, normally it’s around 1/4 cup. Swap out the water quantity and replace with red wine.